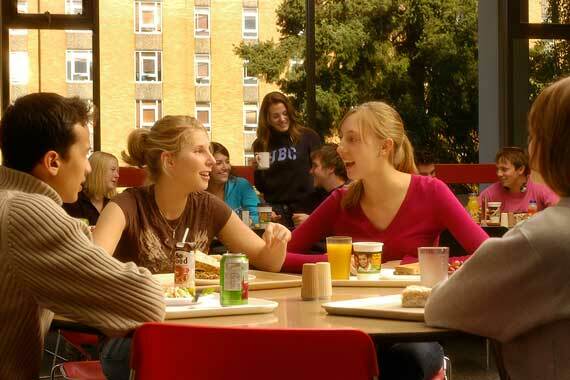 Research tells us that adjusting to university life is stressful. One great way to combat stress is by staying healthy and keeping your body fuelled with the right kinds of food. The number of calories you need per day is based on your age, weight, height and level of physical activity. For example, an active 18-year-old female needs 1,600–2,200 calories, and an active male needs 2,500–2,700. Don’t deprive yourself. Try to eat healthfully 80 per cent of the time. You can do this by making half of your plate vege­tables then adding whole grains, a small portion of lean protein and fruit for dessert. And don’t forget at least one calcium-rich, low-fat drink, such as milk or calcium-fortified rice or soy drink. Allow yourself a baked goodie, ice cream or fries once in a while, just not all the time. Avoid oversized meals. Distorted portions add pounds to your waistline. Eat more fresh fruits, vegetables and whole grains. Eat less fried fast food, sweetened beverages and desserts. There are 44 grams of sugar in a 355 ml can of soda. So go for water, skim milk, 1% milk or a fresh fruit smoothie instead. Don’t eat meals at your desk or while watching TV. And don’t snack on candy and chips while studying. Allocate a specified time to eat, relax and enjoy food with friends in the dining room. Having a proper meal will take you only a few more minutes and you will feel good afterwards. When you get into the habit of eating mindlessly you tend to less healthful foods that you had planned on eating and more junk food.